A traditional kitchen reflects the design elements and architectural features originating from 18th, 19th and early 20th century periods. 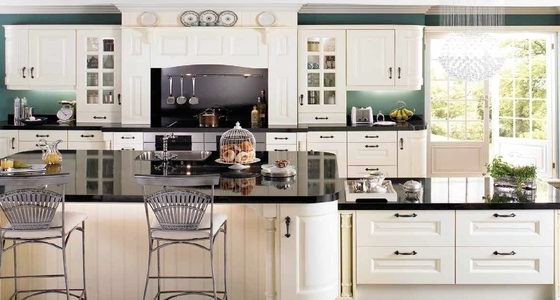 While modern day kitchens embrace minimalism, traditional kitchens are the opposite and instead favor character and ornamentation to create an elegant and luxurious space. 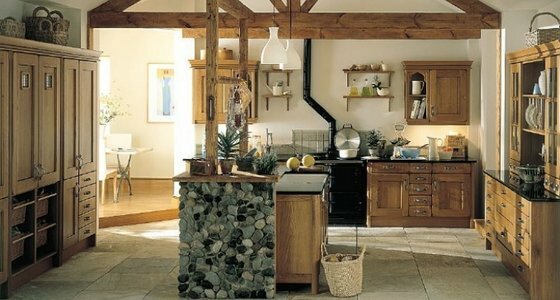 A traditional kitchen exposes all the beauty by using natural materials and has a timeless design for those wanting to have all the appeal of a traditional kitchen; they have remained consistently popular over the years as they bring charm and warmth, as nothing feels quite like home like a traditional kitchen. You can choose a design with the components of real timbers for the epitome of traditional design or our traditional kitchens now come in a variety of different materials and styles with the detailing to achieve that traditional bespoke kitchen look at a fraction of the cost of real timber. Many of our traditional designs are available in either a painted smooth matt or grained effect vinyl, or in a painted satin lacquered timber finish in a variety of colours. 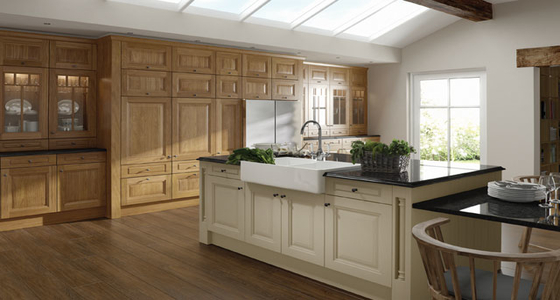 For those wanting to have all the character of a traditional kitchen why not choose the older Pippy oak designs or, if you are looking to combine the old with the new then maybe you desire the variations, which characterise a timber kitchen to its best effect, and a natural oak finish is best suited for you. One thing is for sure, lovers of timber with all its superb individuality and undeniable quality will adore our real wood traditional ranges, whether a cottage or a barn conversion there is something for everyone. This range is supplied by 3D Solutions and is a vinyl wrapped kitchen door with a stile Size of 65mm. This range is supplied by by 3D Solutions and is a timber painted door with a stile Size of 88mm. Please contact the sales team on 0203 291 3091 for further information. This range is supplied by Burbidge Effortlessly stylish, the beautiful Kemble Natural Oak graining is seen to its best effect in the grooved centre panel and angled frame design. Coupled with a host of inspiring accessories, the overall effect makes for an elegant yet homely range. A 90mm solid European Oak framing with a veneered MDF T&G centre panel. 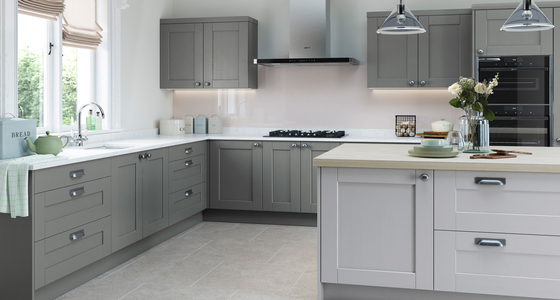 This range is supplied by Burbidge, Kew is elegant yet contemporary with a focus on imaginative detailing that will give your kitchen timeless appeal and has a 90mm solid ash frame with a veneered ash centre panel with a polyurethane painted finish. 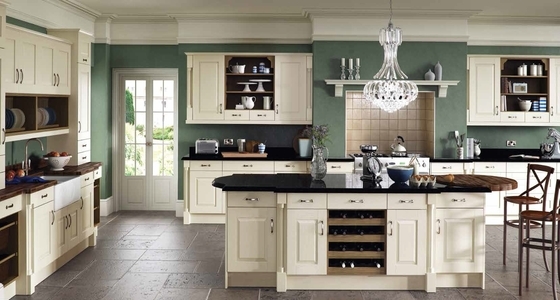 This range is supplied by Burbidge Exquisite detailing and meticulously designed accessories come together in this sublime kitchen classic. 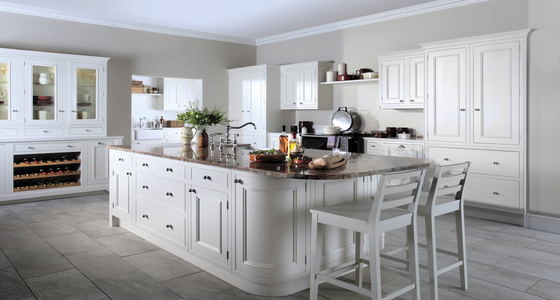 The Salcombe Painted kitchen epitomises luxury British design. Frame is 37mm solid ash. Door is 70mm solid ash frame with veneered flat centre panel and inset ash beading. Painted polyurethane finish. 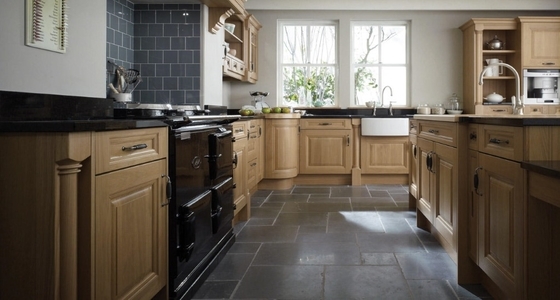 This range is supplied by Kitchen Stori. 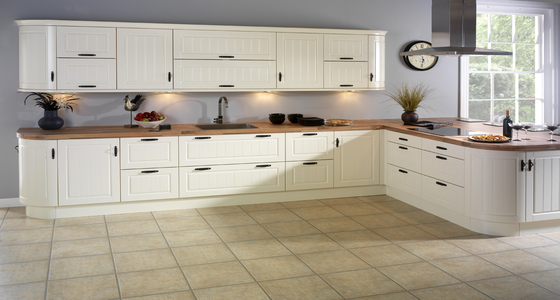 Offering a slight twist on the contemporary shaker, Kensington features a sloped internal profile on the door. Its innovative design combined with its PVC exterior and woodgrain finish, allows you to accomplish a stunning kitchen at a price you can afford. 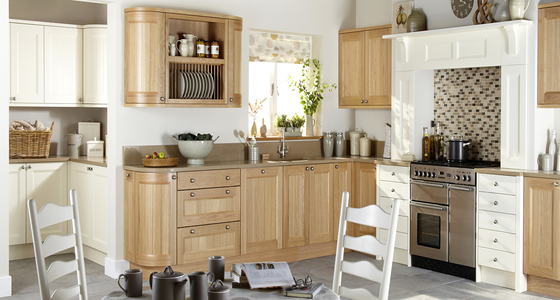 This range is supplied by Second Nature, Cornell is the epitome of a classic country kitchen. Available in classic Alabaster and Oak as well as 27 painted finishes, it is ideally suited to a formal period interior. 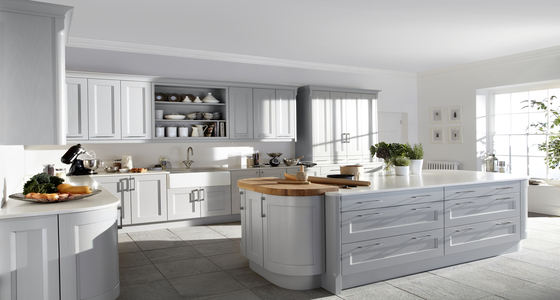 Team it with complementary curved glass feature doors, a Belfast sink and plate racks for a timeless style. 5 piece Shaker with raised and fielded centre paneling in 20mm. Painted style - solid ash frame and centre panel. Oak style - solid oak frame and centre panel. 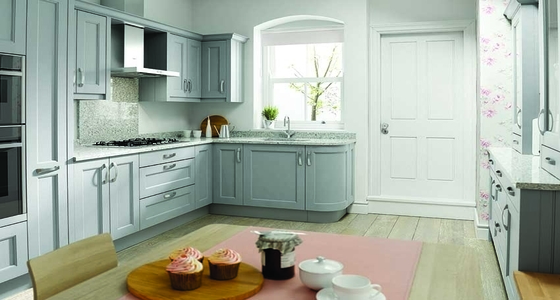 This range is supplied by Second Nature With a solid timber frame and lightly-detailed centre panel, Croft is a great choice for a farmhouse kitchen. 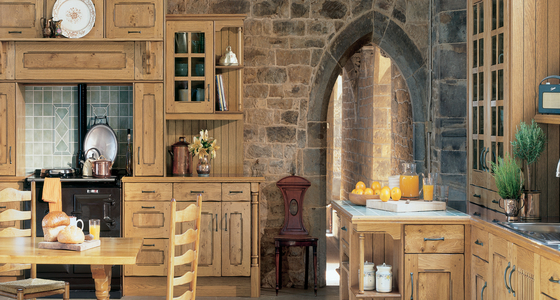 Featuring rustic styling and available as knotty oak or washed, enhance it with curved feature doors, solid wood pilasters or detailed plinths and mantels. 20mm 5 piece shaker with vertical bead and solid oak frame and centre panel lacquered finished. This range is supplied by Second Nature and has a 20mm solid ash frame with a veneered centre panel. With its distinctive ash grain and decorative beaded design detail in a choice of warm neutral painted colours, Mornington is an incredibly versatile door family. A selection of modern and traditional accessories helps to adapt the design around the homeowner’s desired look.